The True Roots of Anti-Semitism. The roots of anti-Semitism are not to be found in the natural realm, but the spiritual. The burden of these studies is to provide scriptural support for the claims in our doctrinal statement and respond to contrary claims. In that regard, our series on Israel was brought to completion several Shofars ago. However, a few items are being added to present a fuller picture. "The True Roots of Anti-Semitism" will conclude this present Israel series. In Part 1: The Divine Aspect, we saw that the true roots of anti-Semitism are not to be discovered in the natural realm, but in the spiritual. Having concluded our examination of anti-Semitism from the divine aspect, we will continue our study in this edition with an examination of the same in its satanic and human aspects. Inasmuch as God is in control of Israel (Jeremiah 18:6) and all other nations (Job 12:23, Psalm 2:1-6, 108:8-9; Proverbs 21:1 and Daniel 2:21), the divine aspect is the most important one to understand. I therefore suggest a study or review of The Divine Aspect before proceeding on. In the case of readers who do not believe that Yeshua is the Messiah, I respectfully urge a careful study of it as it is impossible to understand the suffering of Israel for the last two thousand years without grasping what has been presented, nor would much of what will be presented herein make much sense. 12. For this reason, rejoice, O heavens and you who dwell in them. Woe to the earth and the sea, because the devil has come down to you, having great wrath, knowing that he has only a short time." 13. And when the dragon saw that he was thrown down to the earth, he persecuted the woman who gave birth to the male child. Perhaps more than any other, this passage reveals the hand of Satan in the persecution of Israel. We will therefore examine its symbolism and restate it in literal language. 1. A great sign appeared in heaven: a woman clothed with the sun, and the moon under her feet, and on her head a crown of twelve stars; 2. and she was with child; and she cried out, being in labor and in pain to give birth. 3. Then another sign appeared in heaven: and behold, a great red dragon having seven heads and ten horns, and on his heads were seven diadems. 4. And his tail swept away a third of the stars of heaven and threw them to the earth. And the dragon stood before the woman who was about to give birth, so that when she gave birth he might devour her child. 5. And she gave birth to a son, a male child, who is to rule all the nations with a rod of iron; and her child was caught up to God and to His throne. Who is the woman clothed with the sun in verse 1? This harks back to Genesis 37:9-10, an examination of which will show that the sun and the moon are the man Israel and Rachel, and the twelve stars are the twelve sons of Israel, the patriarchs of the twelve tribes. Clearly, then, the woman represents the nation of Israel. Who is the male child of verse 5? This can be none other than Messiah Yeshua, born of the nation of Israel, ascended into Heaven after His resurrection, and presently seated at the right hand of the throne of God (Hebrews 12:2). And who is the dragon of verses 3 and 4? Verse 9 identifies him: And the great dragon was thrown down, the serpent of old who is called the devil and Satan, who deceives the whole world; he was thrown down to the earth . . . .
Now, to restate verse 13 in literal terms: And when [Satan] saw that he was thrown down to the earth, he persecuted [Israel] who gave birth to [Messiah Yeshua]. Here we see that Satan is the spiritual source of anti-Semitism, and that the reason for his anti-Semitism has to do with the fact that Israel gave birth to Messiah. Satan's anti-Semitism is part of a much bigger "anti": He is anti-God, and Messiah is the second Person of the Godhead. He attempted to dethrone God even before creation (Isaiah 14:12-14). Despite his condemnation and sentencing in verses 12 and 15, he has never ceased to work for the overthrow of God. He seduced our first parents away from obedience to God, and thereby rendered the entire human race subject to his powerful influence (Genesis 3:1-13, Romans 5:12). God immediately informed him that He would raise up a Descendant of the woman who would bring him to utter defeat (Genesis 3:15). Still resisting defeat and longing to gain the ascendancy, as soon as God raised up the nation of Israel to bring forth that Descendant in Messiah (Genesis 12:1-3) he began doing everything in his power to keep Messiah from being born. Hence, the beginning of anti-Semitism. The primary objective of Satan's anti-Semitic acts has always been the thwarting of the ascendancy of Messiah. If Pharaoh would have been successful in killing all newborn Israelite males for a protracted period of time, the nation of Israel would have been stopped dead in its tracks long before Messiah would be born (Exodus 1:15-16, 22). If Herod would have been successful in killing Yeshua in his slaughter of the babes in Bethlehem, Yeshua would never have died for the sins of the world (Matthew 2:16). And what of the massive attack against Israel prophesied in Revelation 12, above? According to Hosea 5:15 and Matthew 23:39, the return of Messiah is predicated upon the return of Israel to her Messiah on a national scale. If Satan could destroy the nation before she turns to her Messiah, he would prevent Messiah's return, his own being bound in the abyss for a thousand years (Revelation 20:2-3) and then being cast into the Lake of Fire which burns forever (Revelation 20:10). Indeed, anti-Semitism's peculiar irrationality and ferocity (discussed in Part 1) is driven not only by Satan's protracted effort to usurp the throne of God, but by his desperate effort to prevent his own demise and eternal damnation. His final assault on Israel will be carried out with such determination and ferocity that God will need to intervene to bring those days to an end to prevent the destruction of the entire nation: Unless those days had been cut short, no life would have been saved; but for the sake of the elect those days will be cut short (Matthew 24:22 and Mark 13:20 with Zechariah 13:8). Context shows that the elect here refers to Israel. Satan's persecution of Israel is often by means of stirring up direct physical violence. That will be the nature of the persecution of the woman in Revelation 12:13. We know that because of verse 15: And the serpent poured water like a river out of his mouth after the woman, so that he might cause her to be swept away with the flood. When Scripture uses the figure of a flood symbolically, it refers to a military invasion. This is seen in Daniel 9:26, where the prophesied Roman invasion and destruction of Jerusalem in 70 C.E. is pictured as a flood. It is also seen in Nahum 1:8, in which the prophesied destruction of Nineveh was prefigured as a flood; and Nineveh was destroyed in 612 B.C.E. by the military invasion of the allied forces of the Medes and Babylonians. Sarai (Sarah) was taken into Pharaoh's harem, an act which God actively undid (Genesis 12:10-20). If the situation had been allowed to continue, Isaac would never have been born, the covenant line would have been cut off, and Messiah would never have been born. Sarah was taken into Abimelech's harem (Genesis 20:1-2), an act which God likewise undid. Similarly, if the situation had been allowed to continue, Isaac would never have been born, the covenant line would have been cut off, and Messiah would never have been born. Surely, Satan was the behind the scenes manipulator of these events which would have permanently separated Sarah from Abraham - six hundred years prior to the drowning of the Israelite babes. Can these attempts of Satan to thwart the purposes of God through Israel truly be considered anti-Semitic? Seeking to render the nation impotent to fulfill the purpose for which she was called is as anti-Semitic as any attempt to destroy her physically. Another tactic employed by Satan is to weaken Israel by bringing her into disfavor with God. In proportion to the extent he could accomplish that, to that proportion is God likely to bring judgment upon Israel and less likely to accomplish His purposes through her. And Satan stood up against Israel, and moved David to number Israel (1 Chronicles 21:1). What David did here was to assess his military strength (verse 5) either to glory in his forces or to engage in wars that God did not authorize, or both. This sin of David brought the judgment of God upon Israel in the form of a plague that claimed 70,000 Israelite lives (verses 7-14). And [an angel] showed me Joshua the high priest standing before the angel of Jehovah, and Satan standing at his right hand to be his adversary (Zechariah 3:1). Whereas in 1 Chronicles 21 Satan brought Israel's king into disfavor with God, here we see him attempting to bring Israel's spiritual leader into disfavor with the preincarnate Son of God. All of Israel's idolatry and disobedience in the wilderness and in the Promised Land, and all of her rejections of Messiah right up to the present time have their origin in Satan's efforts to bring Israel into disfavor with God (1 Samuel 15:23; John 8:44, 17:12; Revelation 12:9). Indeed, in Exodus 32:1-14, after Israel worshiped the golden calf at Sinai, God bid Moses, let Me alone, that My anger may burn against them and that I may destroy them (verse 10); and verse 14 emphasizes that He would have done it had not Moses interceded. The great volume of visible attacks that the church has launched against the Jews through the centuries, whether physical, theological or social, have a satanic aspect to them that is hidden. A major call of the church is to provoke [Israel] to jealousy (Romans 11:11) by demonstrating the blessings of knowing Israel's Messiah. Instead, the church's horrific persecution of the Jews for nearly the entire Church Age has instead provoked Israel to revulsion at the thought of the church's Jesus being their Messiah! So, from Satan's point of view, if he could not destroy the Jews physically, then the least he could do is use the church's repugnant anti-Semitic record to keep Israel from being saved, and thereby prevent Messiah's return and his own demise. 1. The purposes and influences of God and Satan are invisible, but anti-Semitism in its human aspect is visible (though not always recognizable as anti-Semitic at its root, as with Pharaoh and Abimelech). The human aspect of anti-Semitism will be addressed in two categories: "Individuals" and "Nations." Even before they became corrupted by sin, Adam and Eve proved vulnerable to the temptations of Satan. Mankind is now even more vulnerable because, in addition to having a free will as did our first parents, he now has an inner propensity toward sin, which traditional Judaism calls the yetzer hara (Hebrew), the evil inclination, and which believers in Yeshua call the sin nature (Jeremiah 17:9; Romans 7:23; Ephesians 2:3; Galatians 5:19-21). Even so, as uncanny as it is, there are anti-Semites among Jews and true believers as well.2 How can this be? They, too, have the sin nature and are tempted by the Devil. They, too, are subject to being weakened or deceived by unhealthy sociological, psychological and physiological influences. As concerns believers, much anti-Semitism could have been, and could be, preempted by means of proper biblical instruction and study concerning Israel - let alone the more fundamental principle of loving your neighbor, and even your enemies (Matthew 5:44; 22:39, etc.)! Nations, of course, are made up of individuals, and are therefore likewise vulnerable to anti-Semitic attitudes and acts, but on a national scale, whether they be by informal grassroots agreement or by authoritative encouragement, edict, or military organization and attack. Among nations, the Arabs must be given special focus in the context of anti-Semitism as Scripture reveals relevant specifics about them. The chief patriarchs of the Arabs are Ishmael and Esau. We'll address them in chronological order: first Ishmael, then Esau, and then we'll make a few comments about the Arabs overall. The origins and nature of the Ishmaelites and their attitude towards Israel are detailed in Genesis 16:1-16; 21:20-21; 25:12-18.
a. Abram had been promised a covenant son by God in Genesis 15:1-4, but after perhaps only a year, he took the fulfillment of the Lord's promise into his own hands by having relations with Sarai's Egyptian handmaid Hagar, and Ishmael was born (Genesis 16:1-4,11). We know that Ishmael was not the covenant son because God promised that the covenant son would be born through Sarah (17:15-19). 4. [Abram] went in to Hagar, and she conceived; and when [Sarai] saw that [Hagar] had conceived, her mistress [Hagar] was despised in her sight. . . . 6. So Sarai treated her harshly, and she fled from her presence. According to the custom of the day, Sarai, being barren, gave her handmaid to her husband so that an heir might be born through her. However, as the passage makes clear, her despisement of Hagar rose up because of Hagar's becoming pregnant, the direct result of the relationship to which Sarai had been matchmaker. Therefore, Sarai cannot be held guiltless in her treatment of Hagar. Having said that, it is almost certain that anti-Semitism already resided in the heart of Hagar: "It is known from Egyptian records of this period that Egyptians were all full haters of anyone of Semitic origin. "3 Note the absolutes "all" and "full." If that was the case with Hagar - and it almost certainly was - it is likely that her anti-Semitism had already primed Sarai's despisement of her. 10. I will greatly multiply your descendants so that they will be too many to count. . . . 12. [Ishmael] will be a wild donkey [wanderer] of a man, his hand will be against everyone, and everyone's hand will be against him; and he will live to the east of all his brothers. Though more so in the past, many Arabs are still nomadic. f. Hagar ultimately took an Egyptian wife for Ishmael (Genesis 21:21). Whatever anti-Semitism was instilled in Ishmael by his Egyptian mother was almost certainly reinforced by the same in his Egyptian wife. His mother and wife were almost certainly "fully" anti-Semitic. His mother was driven out twice by Sarah, and so was he: once as a preborn and once as a teenager. Isaac was the covenant son, not he. Significantly, the ongoing anti-Semitism of the nations proceeding from him was prophesied (Genesis 16:12, above), indicating that an unbroken thread of anti-Semitism was to pass from Ishmael to his descendants throughout his generations; and other passages show that it will last until great revivals take place among some of the Arab nations at or near the beginning of the Millennium (e.g., Isaiah 19:22:25; Jeremiah 48:47; 49:6). To put a matter in perspective, Jacob did not take advantage of a brother under duress. If he did, then the text would not say that Esau despised his birthright. Jacob took advantage of a brother who despised his birthright, which is far different. Esau did not have to sell, but he did. The sale was above board, and the purchase by Jacob was legitimate. The birthright was now Jacob's, but it still remained for Isaac to pronounce the patriarchal blessing upon the son of his choice. Whereas the birthright consisted of a double portion of the physical estate, the blessing conferred the leadership of the family upon the son so blessed; and in Isaac's case, it also determined the son through whom the covenantal blessings of Abraham would be conveyed. As in the case of the birthright, the blessing would normally go to the firstborn, but that was not always the case. Jumping ahead a generation, we see that Israel (Jacob) conferred the birthright upon his seventh son, Joseph - I give you one portion more than your brothers (Genesis 48:21-22) - and the patriarchal blessing upon his fourth son, Judah (Genesis 49:9-10). Reuben, the first of Jacob's twelve sons, would normally have received the blessing, but Jacob did not confer it upon him because you went up to your father's bed; Then you defiled it (Genesis 49:4). Similarly with Simeon and Levi, the second and third in line, because their swords are implements of violence (49:5). With the first three sons passed over, it was the fourth in line, Judah, who received the patriarchal blessing (49:9-10); and indeed, Yeshua was born of Judah's line (Hebrews 7:14). Before the twins were born of Rebekah, the LORD said to her, the older shall serve the younger (Genesis 25:23), indicating that it was foreordained that the blessing would be Jacob's, the younger. Nevertheless, when Isaac was about to die, he intended to confer it upon firstborn Esau; but Jacob, through deception, got his father to confer it upon him (Genesis 27:1-29). What shall we say about this? Jacob's deception was unnecessary. God had already determined that the blessing would be his, and He would have arranged for it to be so. Therefore, despite Jacob's machinations, God honored Isaac's blessing of Jacob - and He dealt with Jacob's deceptive tendencies later (Genesis 27:41 - 33:30, esp. chap. 32)! How worthy was Esau to become the covenant son? Hebrews 12:16 tells us that Esau was an immoral and godless person. He married two Hittite women who brought grief to Isaac and Rebekah (Genesis 26:35), no doubt because they rejected the God who covenanted with Abraham and Isaac, and worshiped false gods, instead. What Esau did was exactly what Isaac told Jacob not to do after he blessed him: You shall not take a wife from the daughters of Canaan (Genesis 28:1). Though Esau had despised his birthright and sold it to Jacob, and was unworthy to become the covenant son, yet, after Isaac had blessed Jacob, he cried out with an exceedingly great and bitter cry (27:34) and lifted his voice and wept (27:38) at not having received either the birthright or the blessing. Being an immoral and godless person, his grief over not having received the blessing had nothing to do with his not becoming the covenant son: It had everything to do with his not becoming leader of the clan. for my father are at hand; then will I slay my brother Jacob. Now, Esau was Ishmael's nephew, his father Isaac being Ishmael's half-brother. Although Ishmael had been cast out of the camp the second and final time long before Esau was born, and lived in the wilderness of Paran (Genesis 21:21) deep in the Sinai at least several days journey from Isaac's camp, it is possible that Esau had some contact with his uncle or, at the least, had heard the story of his banishment. If either or both were the case, then Ishmael's anti-Semitism and/or the story of his banishment may have had a negative influence on Esau concerning the covenant line of Abraham, his father Isaac, and after Jacob was blessed, Jacob. We cannot be dogmatic about this as Scripture is silent. Nevertheless, whatever influence Ishmael or the story of his banishment may have had on Esau, subsequent to Esau's resolve to kill Jacob he married Mahalath the daughter of Ishmael, Abraham's son (Genesis 28:9). Thus, the enmity that he already bore toward Jacob was exacerbated by his wife, who was raised in the household of her anti-Semitic father. About twenty years after his resolve to kill Jacob, a great and emotional reconciliation took place between the two, and Esau exhibited great kindness toward his brother. Yet, we can be certain that latent animosity still existed in Esau's heart toward Jacob because Ezekiel 35:5 says that the Edomites bore everlasting enmity toward Israel. If it's everlasting, then it had to have had no complete respite, even in the heart of Esau during his reconciliation with Jacob. Thus we see that the animosity in Esau's heart toward Jacob passed in an unbroken manner to his descendants from generation to generation; and though it may have been latent for some periods as it was in Esau, it was always there, ready to erupt at any time in violent acts. Edom demonstrated this readiness for violence against Israel when Moses sought permission for Israel to pass through Edom (presently southern Jordan) on their way to Canaan (Numbers 20:14-21; Judges 11:17), and Edom refused them passage on pain of attack. Numbers 20:18: You shall not pass through us, or I will come out with the sword against you; and they backed up their refusal with a show of force: And Edom came out against [Moses] with a heavy force and with a strong hand (verse 20). Other passages demonstrate actual, ongoing attacks, such as 1 Kings 11:14, in which Edom was adversary to Solomon, and 2 Chronicles 28:17: again the Edomites had come and attacked Judah and carried away captives. 1. By the rivers of Babylon, There we sat down and wept, when we remembered Zion. . . . 7. Remember, O LORD, against the sons of Edom the day of Jerusalem, who said, "Raze it, raze it to its very foundation." When did Edom say, "Raze [Jerusalem], raze it to its very foundation"? In 586 B.C.E., Nebuchadnezzar destroyed Jerusalem, the capital of the Kingdom of Judah, and carried most of her population captive into Babylon. The plea for the LORD to remember Edom was made by those very captives. As Nebuchadnezzar attacked Jerusalem, Edom cheered him on. This is corroborated in Obadiah 1:11-12; and verses 13 and 14 indicate that they may have actively supported Nebuchadnezzar by attacking escapees and imprisoning survivors. The captivity of the southern Kingdom of Judah into Babylon followed the captivity of the northern Kingdom of Israel into the Assyrian Empire by 135 years. Edom rejoiced over the devastation of the two kingdoms because they desired the entire Land for themselves: These two nations and these two lands will be mine, and we will possess them (Ezekiel 35:10). It is worthy of note that whereas only one of Ishmael's parents was a member of the covenant nation, both of Esau's parents were, and he and Jacob were twins. Obadiah 1:10 makes it clear that the national closeness of Edom to Israel will work against her in the day of her national judgment: Because of violence to your brother Jacob, you will be covered with shame, and you will be cut off forever. Edom's offenses against Israel were so odious to God that He declared that, while virtually the rest of the planet would be restored to pristine beauty in the Messianic or Millennial Kingdom, Edom would remain a desolation (Isaiah 34:8-15, Jeremiah 49:17-18, Ezekiel 35:10-15, Joel 3:19). At least two specific reasons were given: their everlasting enmity toward Israel, and their desire to possess the Land that God had given to His people and which they lost in such a grievous, calamitous manner (Ezekiel 35:10-14). Herod the Great, the cruel Roman puppet king of Judah who slaughtered the Bethlehem babes in a mad attempt to kill Messiah (Matthew 2:16-18), was a full-blooded Idumean (Edomite). Esau became a great nation (Genesis 36:8-43), and the land which they originally occupied (Seir, Genesis 32:3; 36:8) before their geographical expansion is, today, southern Jordan, solidly within the Arab camp. To sum up, the deepest taproots of anti-Semitism in the Arabic peoples are found in Ishmael and Esau, and we know that their anti-Semitism was perpetuated from them throughout their generations because of predictive prophecy, and has, to this day, been demonstrated by repeated acts of hostility. Other ethnicities besides Ishmaelites and Edomites also became part of that mix of peoples known today as the Arabs, such as the Ammonites and Moabites (origins: Genesis 19:35-38). According to Nehemiah 2:19, three Arabs (as we would call them all today) opposed Nehemiah in the rebuilding of the walls of Jerusalem: Sanballat the Horonite and Tobiah the Ammonite official, and Geshem the Arab. (Also Nehemiah 6:1-2.) As for Sanballat's nationality, Horonaim was a city in Moab. In Psalm 83:1-8, the Psalmist Asaph laments the ongoing animosity of neighboring nations toward Israel. Note how closely verse 6 juxtaposes the Ishmaelites and the Edomites: The tents of Edom and the Ishmaelites. They are also the first ones mentioned of the nations named in verses 6-8, several of which are Arabic. Verse four is worthy of note: They have said, "Come, and let us wipe them out as a nation, that the name of Israel be remembered no more" - a refrain repeated daily today within those very nations! Also Ezekiel 35:1-5 and Obadiah 10-14. The first clause of the statement is consistent with the fact that most Arabs believe that Ishmael was the covenant son of Abraham, not Isaac. Without a doubt, what Scripture prophesied of the Arabs as a whole in regards to anti-Semitism has been borne out over thousands of years of history. However, as in our relations with any people, judgment of intent and character of individuals must be carried out on an individual basis. Indeed, there are Arab individuals and groups today who, at the risk of life and limb, openly support the State of Israel and the fair treatment of Jewish people. Links to some of their websites may be found in the Modern Israel and World Jewry section of our Resources page. We have just concluded the heart of "The Spiritual Roots of Anti-Semitism." In our next Shofar, we will add an examination of key accusations against the Jew to which the Bible speaks, a Bible based examination of the futility of anti-Semitism, a fuller look at the attitude of God concerning those who bless or curse the Jews, an examination of the consequences of the same in biblical and postbiblical times, and what can be done within biblical limits to battle anti-Semitism. We may also address the common claim that the New Testament promotes anti-Semitism, and refute a handful of contemporary accusations made against the Jews. Please continue to Anti-Semitism, Part 3: Refutation of Accusations against Jews and Israel. 1. Flannery, Edward H. Judaism-now Blogspot, http://judaism-now.blogspot.com/2010/12/pagan-influance-of-christmas.html. Judaism-now. 2. Lest anyone doubt that a true believer could be anti-Semitic, let him read Martin Luther's On the Jews and Their Lies. Caution: Strong stomach required. Martin Luther, On the Jews and Their Lies, 1543, from Luther’s Works Volume 47, translated by Martin H. Bertram, (Fortress Press & Augsburg Fortress, 1971). Also online at http://www.humanitas-international.org/showcase/chronography/documents/luther-jews.htm. 3. Arnold G. Fruchtenbaum, Dr., Messianic Bible Study 008: Arab States in Prophecy, pdf, p. 7. 4. C.F. Keil and F. Delitzsch, Keil and Delitzsch Commentary of the Old Testament (Hendrickson Publishers, 1996). 5. Fruchtenbaum, op. cit., p. 7. 6. Smith, F. LaGard, The Chronological Bible (Nashville, E.E. Gaddy & Associates, Inc., 1977). 7. 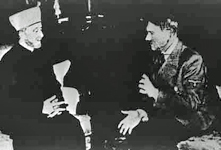 Richard Bard, "The Mufti and the Fuhrer." http://www.jewishvirtuallibrary.org/jsource/History/muftihit.html. 8. Sura II, v. 71-85. 9. Sura CXI, v. 117-120. 10. Sura IX, v. 29. 12. The name Abdullah means Servant of Allah. Flannery, Edward H. The Anguish of the Jews: Twenty-Three Centuries of Antisemitism, first published 1965, latest edition: (Mahwah, Paulist Press, 2004). Leventhal, Barry, Dr. "Can a Christian Be an Anti-Semite?" Association of Messianic Congregations, http://www.messianicassociation.org/a-bl-antisem.htm. Zuckerman, Mortimer B.. "Graffiti On History's Walls," October 29, 2003, Jewish World Review, http://www.jewishworldreview.com/mort/zuckerman_new_anti_sem.php3. * For general facts on anti-Semitism and daily news updates from an Israeli point of view, the author recommends sources in the "Modern Israel and World Jewry" and "News of Israel and World Jewry" sections of our Resources page. are also available at Ariel.